In April 2017 there was a flurry of blog posts and a hangout about open pedagogy–various ways of defining it, thinking about it, etc. That was during a heavy teaching term for me and mostly I just saw that it was happening and read maybe one or two of the many blog posts at the time. You can see a curated list of them, here (thanks Maha Bali!). In a couple of days I am presenting on a panel for the BCcampus Open Textbook Summit, called Open Pedagogy Case Studies & Examples from Langara, UBC and Athabasca. Marianne Gianacopoulos (Langara), Michael Dabrowski (Athabasca) and I will be speaking on projects we’re involved in that we each think of as having an element of open pedagogy. So we’re starting with a discussion of just what “open pedagogy” is. Thus, I figured it was time to visit that large number of blog posts linked above. This post is my somewhat rambling reflections on reading some of the posts Maha Bali curated (linked above). The next one, part 2, is where I will try to pull some of these threads together into a revised view of my own. If I remember our discussions about it correctly, the spectrum ranges from low-ish degree of difficulty (on the left) or effort to higher (on the right). That said, we had a lot of conversations about this because there are so many different factors to take into account, and not everything fits well on a spectrum like this. Plus, adopting OER for a course is not necessarily on a low level of degree of difficulty! It requires actually finding relevant and high quality OER, and changing up one’s course at least to some degree, to accommodate the new material. Still, it’s arguably somewhat less effort that adapting or creating new materials. This chart is still partly focused on content–it talks largely about adopting, adapting, creating OER. But there is more there, especially towards the right side of the chart. We talk about students and instructors connecting and collaborating with communities outside the course, as well as about students co-creating courses. On the far right there is also discussion of students and faculty sharing their reflections and processes, which could include how they created content, or how they collaborated on courses, or reflections on how things went. In an explanation of open education that I wrote for a teaching award (which I didn’t get but am happy I wrote this! ), I quoted Tom Woodward from an interview Mary Grush did with him for Campus Technology. [Woodward refers to open pedagogy as] “a general philosophy of openness (and connection) in all elements of the pedagogical process,” where “[o]pen is a purposeful path towards connection and community” (Grush, 2013; italics in original). Thus, open pedagogy can also include open assignments, which allow students to shape how they will show evidence of learning (or even create assignments for other students to do); open course planning, in which one invites comments and contributions from others when planning a course; and what Woodward calls “open products,” where students publish their work “for an audience greater than their instructor. … Their work, being open, has the potential to be used for something larger than the course itself and to be part of a larger global conversation” (Grush, 2013). 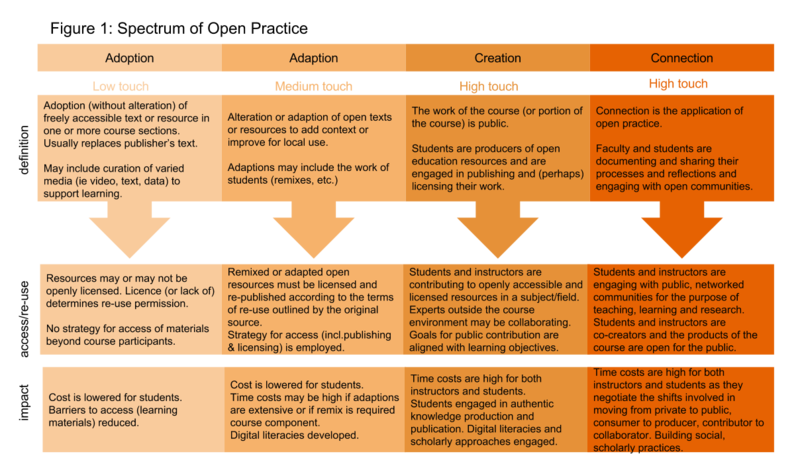 Open course planning, which I first saw via Paul Hibbits at an ETUG (British Columbia Educational Technology User’s Group) meeting in 2014. See my blog post about that here. I have practiced open course planning twice so far; see blog posts here and here. Asking students to do renewable, or non-disposable assignments in courses. These involve students creating things that others can revise and reuse, that add value to the world beyond the course. I wrote a post about renewable assignments for UBC’s Flexible Learning site in 2015. These can range from things like students contributing to Wikipedia to students doing work for community partners, to students writing blog posts that might be useful to others (the latter is what I have done in my courses so far). Involving students in co-creating the curriculum, such as through helping to choose some of the course topics, choosing the nature of assignments for the course, or creating texts, videos or other content for the course. I haven’t done any of this yet in my own courses, though I keep thinking I should! Engaging in open reflection on educational practices and processes, whether by students or profs or staff or anyone else involved in an educational experience. A number of professors use blogs to do this sort of reflection, such as this blog right here! Nevertheless, since the conversation is currently about open pedagogy rather than open practices, I’ll stick with the former term here for the moment. Rather than trying to summarize and synthesize all the blog posts Maha Bali gathered, I’ll mention a few things that were brought up in some of them (I can’t read them all!) that leading me to think more deeply about open pedagogy and my own previous views. Open pedagogy as requiring involvement of OER? 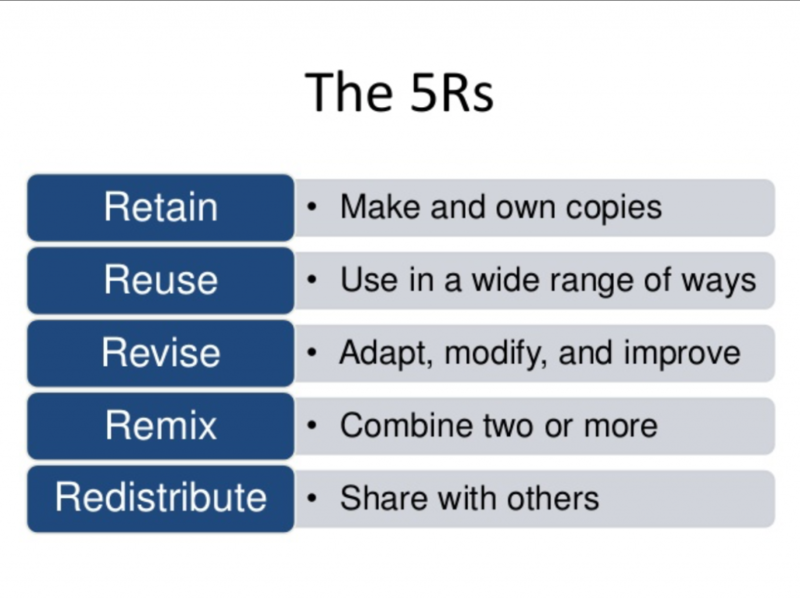 the set of teaching and learning practices only possible or practical in the context of the 5R permissions. Or, to operationalize, open pedagogy is the set of teaching and learning practices only possible or practical when you are using OER. Here is a more in-depth discussion of the 5R’s Wiley is talking about. This emphasizes open licenses as part of open pedagogy–the latter is what is made possible when people share their work using an open license. That is what allows, e.g., for revisions of OER by faculty and students. And students creating work with open licenses then would count as open pedagogy. Note, though, that after a flurry of Tweets and blog posts, he added another set of thoughts, looking at how there seem to be two views of “open” working in the recent discussions of “open pedagogy.” More on that below. [Addendum the next day:] Maha Bali pointed out to me that Wiley wrote yet another blog post in which he said he was going to stop using the term “open pedagogy” and use the above definition for a new term called “OER-enabled pedagogy.” This is because the terms “open pedagogy” and “open educational practices” do not have agreement on what they mean, so it’s difficult to use them, he says. 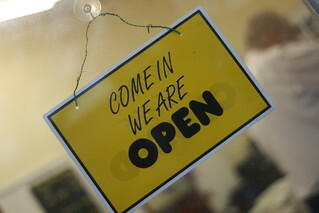 What is the “open” in open pedagogy? My view of open pedagogy is basically a list of practices. But what makes these “open”? What is it about reflecting publicly on teaching, or having students contribute to public knowledge or co-create the curriculum that makes these things “open”? The following is a list of ideas gleaned from several recent blog posts on open pedagogy. It is in no particular order. As I’ve argued many times, the difference between free and open is that open is “free plus.” Free plus what? Free plus the 5R permissions. While almost the entire internet is free to watch, read, and listen to, only a small slice of the internet is open – licensed in a way that grants you the 5R permissions. These permissions are the distinguishing feature of open, whether you’re talking about open educational resources, open source software, open data, or a range of other open things. But I have still thought of students helping to co-create the curriculum as “open” in some way even if this doesn’t involve creating content that is given an open license. Why do I think that? Humans are the center of pedagogy or educational praxis. It’s students and teachers and their interactions that are the essence of pedagogy. That means that pedagogy is not just about some instructional design strategy, it’s about power relations. Who gets to do what? Who gets to tell whom what to do? Who sets the bounds and the rules? … To me, any pedagogy is primarily about power relations and therefore freedom. Since pedagogy is about process and power relations, then openness in pedagogy is about freedom and connection. It’s about the degrees and ways in which a pedagogy is free and mutual. This starts to make sense of my previous just kind of rough sense of some kinds of practices being “open.” Providing students more freedom in their education, freedom to co-create curriculum, and interactions with people outside the course fit with these ideas on freedom, mutuality, and connection. Luke talks about a range of openness in pedagogy, such as courses that take place and encourage interactions only with a closed group of people vs. those that involve connections to wider communities, or courses that involve the students bringing their own authority rather than only emphasizing the authority of the instructor. I like how Bali focuses on the social justice aspect of openness and open pedagogy. In large part those of us who are interested in these things are so because of the two elements of this ethos: improved learning for students and caring about equity for them and in the wider world. Intentional approaches in teaching that encourage students to have “the will to explore different perspectives and change one’s mind as new information is presented”(emphasis mine). Koseoglu goes on to discuss further the emphasis here on exploring different perspectives: “How do we … nurture democratic learning environments where people get exposed to different perspectives, challenge the way they view the world and their position it?” So here, openness in pedagogy is connected to having an “open mind,” one might say, and being willing to listen to alternative views and change one’s mind where that is called for. On reflection it seems that the subtle difference between these two forms of open is that the open in OER, etc. is a matter of free access plus copyright permissions, while the open in open web is a matter of free access plus no requirement to seek approval before creating or inventing. This could connect to Luke’s point about freedom and Hegarty’s view that one aspect of open pedagogy is encouraging “spontaneous innovation and creativity” (as quoted above). No doubt we have yet to see definitions of open pedagogy that approach from other open traditions, like the “open” in open government where open primarily means transparent. This makes sense to me: open pedagogy could involve being transparent about how one is teaching and why, or what one is doing as a learner to show one’s learning, and why. Rajiv Jhangiani, in a post on the Year of Open website, also says that “open pedagogy would also encompass instructional practices such as open and transparent course design and development.” And one could argue that things like learning outcomes and program outcomes are in part doing that kind of work. Tannis Morgan looks into the history of the term “open pedagogy” (so does Gill Green, in his post on the Year of Open website) and discusses (among other things) a 1979 article in French by Claude Paquette called “Some fundamentals of an open pedagogy” (translation mine; probably not an adequate translation as my French is not very good!). Paquette outlines 3 sets of foundational values of open pedagogy, namely: autonomy and interdependence; freedom and responsibility; democracy and participation. He goes into some detail about these, but us ed tech folks will recognize some of the themes – individualized learning, learner choice, self-direction, – to name a few. This isn’t from one of the blog posts curated by Maha Bali, but from a set of slides by Robin DeRosa that I found while searching for an image for the top of this post. No gates. No hoops. No end. The first three are pretty self-explanatory, and she goes on in later slides to discuss them further. [Addendum later: DeRosa also talks about the first and third points in this blog post included in the curated list by Maha Bali). The last one I think of as making learning as accessible as possible, and trying to make, as she says in a later slide, the community and the course continue even after it is over. One could do that by encouraging lasting connections between students, students and instructor, students and people outside the course, or between students and what they are studying such that they continue that work later. These things are my own interpretations of what she might mean by her last bullet point. Basically what this review of some of the recent blog posts out there on open pedagogy has done for me is make me realize that I have been operating with a kind of list-of-activities view of open pedagogy, without really understanding why I think those activities should be categorized under “open practices.” And this feels pretty overwhelming because I have gone down the road in the past of trying to determine what I think “open” means and didn’t get very far. Partly because I think it’s quite likely different for different kinds of “open” practices and entities (e.g., open government, open science, open access, open source software, OER, etc.). So what could it be that is added to “pedagogy” to make it open, that might be similar to or different from what is added to, for example, science or data that makes these open? What’s even harder, for me, is that to start to answer that question one has to determine what “pedagogy” is (or andragogy, or heutagogy, as noted above). And the fact is, there are many different kinds of pedagogy. I’m starting to wonder if David Wiley might be right in suggesting that perhaps “open pedagogy” by itself makes less sense than trying to think about what “open constructivist pedagogy” or “open connectivist pedagogy” might be. So for me, this might be another reason to start talking more about open educational practices and less about open pedagogy. Or maybe that will just lead to the same problems. Okay, more tomorrow in part 2!